Saddle up for some adventurous tasting in the mountainous capital of Argentina’s thriving wine scene, where old-world expertise meets new-world innovation, with our travel guide from Lonely Planet's new book Wine Trails. Maybe you can’t distinguish between Italian wine regions on a map, or explain the difference between French and American oak barrels. But unless you’ve been living under a rock, chances are you’ve noticed that right now Argentina is hot on the international wine scene. Think about it: you can’t glance at a wine list without seeing the word ‘Malbec’, or turn on the radio without hearing a chef talk about the best-value Argentinian bottles for your summer barbecue. If the runaway popularity of Argentinian wine strikes you as sudden, you’re not alone. Even Argentinian people didn’t realise how fantastic their wine could be until fairly recently, though it’s safe to say they were always fully aware of the natural beauty of Mendoza. The nation’s wine-producing capital occupies a spectacular stretch of sun-drenched landscape at the foot of the snowcapped Andes. Even if there weren’t any vineyards around, it would still be a popular travel destination, thanks to its gorgeous weather and picture-perfect opportunities for hiking, horseback riding, skiing, fishing, whitewater rafting or cycling. Luckily for travellers there is indeed a glass, or several, waiting for you at the end of that bike ride. The wine produced in Mendoza, whether in the longer-established region of Luján de Cuyo or the up-and-coming Uco Valley, isn’t just the product of the natural landscape. It’s the result of a new generation of winemakers that knows the rules of French or Italian winemaking – and knows how to break them. It’s a South American playground for innovation, the meeting point between tradition and new technology. Raise your glass: here in Mendoza, it’s a brave new world. 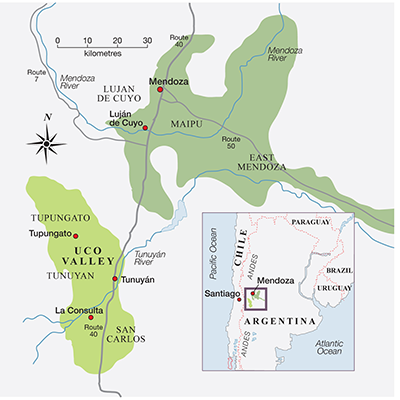 Mendoza El Plumerillo is the nearest major airport, 8km from Mendoza. Car hire is available. Complete with a wine cellar, this elegant 81- room hotel is located near one of Mendoza’s main squares – a good choice if you’d like to stay in town. This sleek, sustainably built lakeside getaway, featuring a stylish restaurant and complimentary horseback riding on its large property, is located within easy reach of many of the best wineries in the Uco Valley. The lavish lunch with wine pairings in Luján de Cuyo, overlooking vineyards nearly as far as the eye can see, is a wine-country classic. Located in a romantic old house and courtyard garden, 1884 is a landmark restaurant by pioneering Argentinian chef and winemaker Francis Mallmann. Arrange a hike, a horse-riding excursion, a rafting adventure, or even a side trip to Aconcagua — the highest point in the southern hemisphere — with one of the many outdoor outfitters in town. For an active excursion closer to the city centre, rent a bicycle, either independently or as part of an organised winery tour. Back in town, stop by the Vines of Mendoza tasting room to sample wine from the surrounding region. The event of the year in Mendoza is the Fiesta de la Vendimia, or the annual harvest festival, taking over the city for 10 days at the beginning of March. Although the celebration honours all of the region’s fruits, the grape, of course, takes centre stage. Highlights include traditional foods, folkloric concerts and a colourful parade and pageant to crown the queen of the festival. Be sure to book ahead: Vendimia draws huge crowds, both from Argentina and abroad.